Bad weather: do you have to drive? It’s sensible for drivers to ask themselves whether they really need to drive in potentially dangerous weather conditions. Avoiding travel in stormy weather is the safest, if not always the most practical, course of action. You wouldn’t go outside in freezing cold weather without a warm coat, so why head into a storm without first checking for disruption? Plan your route and go online to see if there are likely to be road closures or delays. Driving in strong winds: hold that door! This is one of the most obvious pieces of advice but it’s easily forgotten. When you’re opening a car door in strong winds, especially from the inside, have a firm grip of the door handle and be prepared for the wind to catch it. High winds can cause serious damage to a door’s hinges. In turn that can give you a real pain in the pocket or purse. Also, try to avoid parking beneath trees or a building’s roof. Falling debris could damage your car or, worse, people. Some drivers find it more relaxing or feel they look cool driving with one hand on the steering wheel. This is never a good idea, and it’s especially silly when faced with strong gusts of wind. Grip the wheel firmly with both hands. 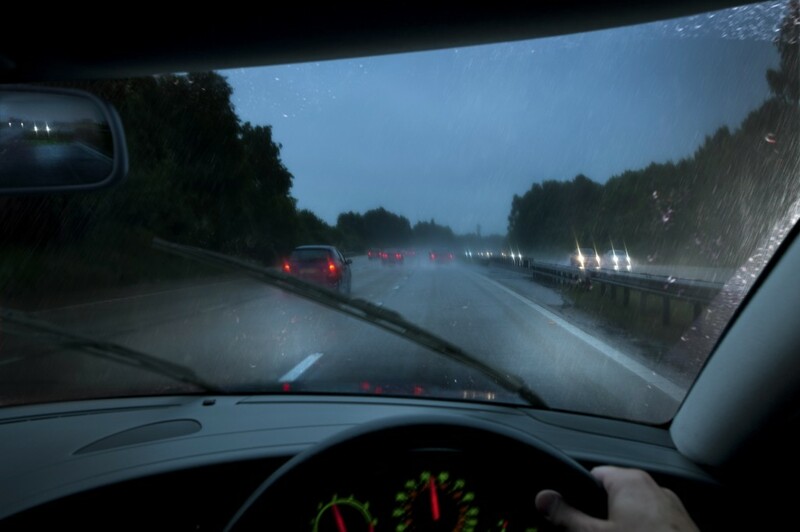 Your car, and other vehicles on the road, are going to get blown around by side winds, says Richard Gladman, IAM RoadSmart’s head of driving and riding standards. Reduce speeds and increase the distance between you and other traffic. The IAM advises to do this according to driving conditions, especially when roads are wet. Also, be wary of high-sided vehicles, motorbikes and cyclists. They are all particularly vulnerable to the effects of the wind. Can you stop in the distance you can see ahead? Trees, branches, bits of buildings, the occasional trampoline and localised flooding can all be lurking unseen around a corner. Drivers should slow down before a bend, says Richard Gladman, and ensure they can stop on their own side of the road in the distance they can see. As drivers pass gaps between trees or buildings, or cross bridges, they should expect greater exposure to side winds. Concentrate and anticipate the effects of wind. And remember: when you switch from a windy section to a sheltered area, the sudden loss of winds can be just as unbalancing to a vehicle. If this is called “advice” well and good. It seems more like common sense turned into a rather long and drawn out piece. Exactly how can one expect an occurrence which to all intents and purposes cannot be expected? All good advice and common sense really. Problem is, the people who most need to learn these lessons probably do not read road safety advice. I have been driving for over 50 years and have only ever made one insurance claim when a dog ran across a dual carriageway on a dark wet night. Some great advice in this article, thanks. I’ve noted on many occasions that with side winds one can be sheltered from the wind when overtaking heavy goods vehicles only to feel the sideways force of the wind once you have past. HOLD THAT DOOR. Forget the hinges, they can be repaired, it is YOUR BODY at danger by the wind whipping at the door and slamming into your arm/shoulder/any other part of you. Friend on mine had a big shop in the car when her car door slammed into her arm and broke it, luckily she didn’t also have a car load of children and dogs. A really ghastly situation to deal with. Also when parked parallel and close by to another car, the door can cause a lot of damage to the other car when the wind blows it open into the side of the other car, not only costs money but takes a lot of time to deal with. All sound advice but also all apply to driving whether windy, icy or sunny and calm. Right nor wrong at least Green Flag are pro-active. Many thanks for caring.